On Monday morning the Houston Police Department announced the death of retired Senior Police Officer Edward A. Thomas. Thomas died Monday morning at the age of 95 of natural causes. On July 27 the department’s 26-story Travis Street building was renamed for Thomas, who served 63 years with HPD. He was known as “Mr. Thomas” around the department by friends and fellow officers. “Mr. Thomas persevered and served with dedication and hard work. At the time of his retirement, he was the most revered and respected officer within the Houston Police Department,” the department said in a statement Monday. Thomas graduated from Cadet Class No. 1 in 1948. 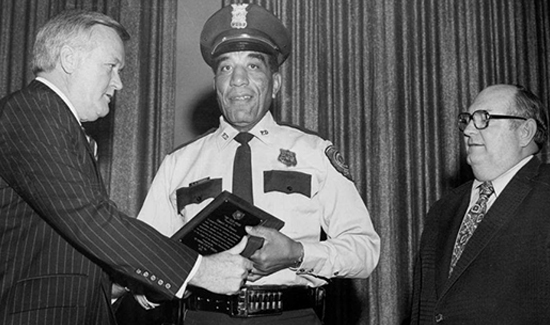 As one of HPD’s first black officers, he worked a foot patrol in a mostly-black neighborhood because he wasn’t allowed to drive a squad car. Subjects had to be taken to jail on foot or using mass transit, and he had to ask for a supervisor’s permission before arresting a white person. Thomas also wasn’t allowed to dine with white officers or share their water fountains.